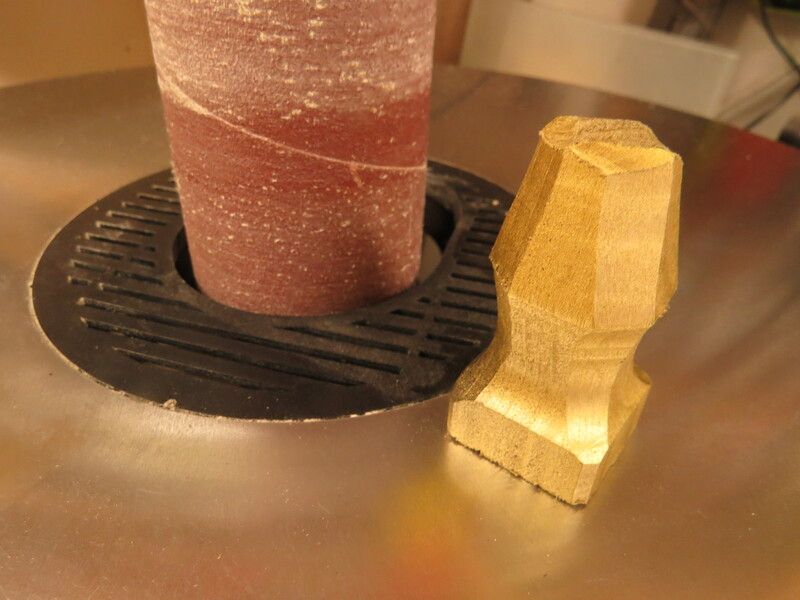 I have long since wanted to make chess pieces in one way or another. Then, when Meyer Maschinenhandel approached me and asked whether I had an idea to showcase one of their spindle sanders (the Record Power BBS2). I had just the right piece in mind – 32 pieces, to be exact. Using a square beam from the home center, all you need other than the spindle sander is a saw – anything that can cut wood to size. You can watch the video right now, or read on below for more information about the project. Enjoy, and be Inspired! 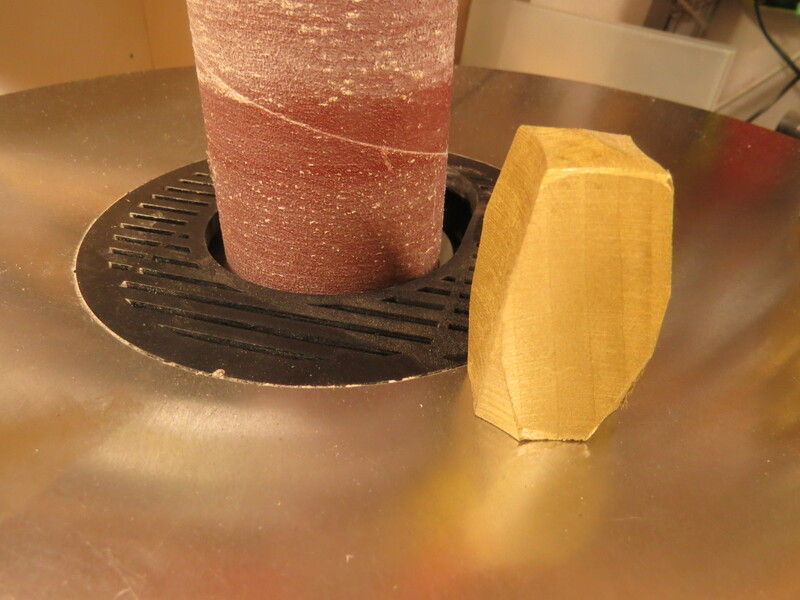 The spindle sander is an interesting exercise in spatial thinking. It removes material in the shape of the drum (which by nature only does round coves – the spindle sander for corners has yet to be developed). 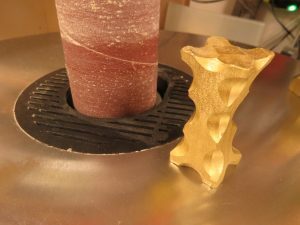 You can create any number of interesting shapes using those coves, at different angles and depth, and different spindle thicknesses. Let’s go through the various designs in this set. I tried to keep them simple, and they would have been even easier using the largest spindle. I started getting into things with the top, crossing two shallow coves. Here, the middle spindle works best I think, but the result was more than I was hoping for. Gladly, I managed to hit the right spots both times on the first go, otherwise, I might have skipped this idea entirely. For this one I thought about doing vertical coves only, but the test piece had an unfinished look about it, so I experimented with a smaller middle and something akin to crenelations. I think it works, giving this a clunky yet sturdy look. 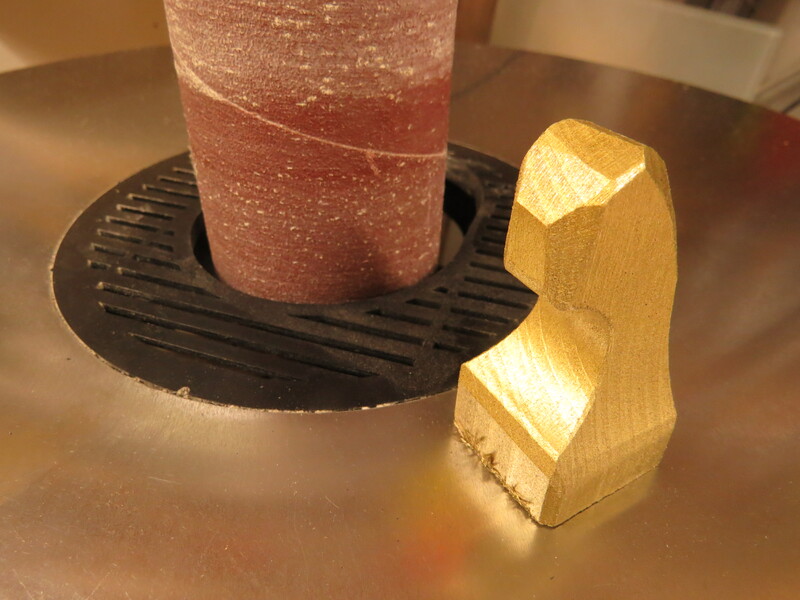 It also made for a rather simple piece, easy to replicate and not enough material to remove. Where the rock was an easy one, the bishop turned out to be rather complicated, especially when it came to replicating. 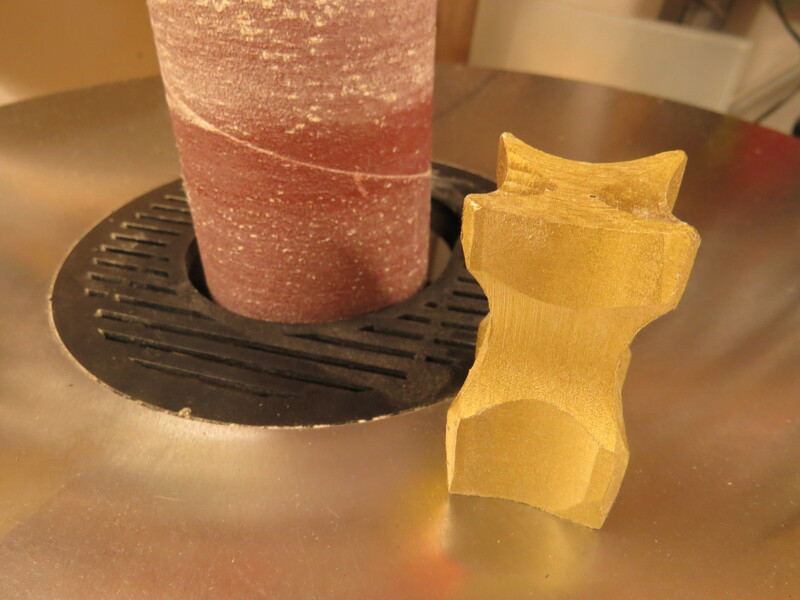 Sanding on four sides with two different table settings made it trickier than expected to create an even piece. 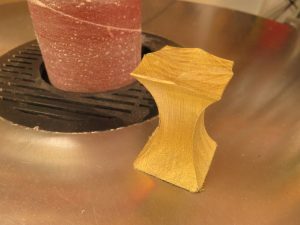 Initially, I had considered using the table at about 25° and flip the piece over, but that would have made it even more of a mess. Like I said in the video, it would have been nice to use the bandsaw or another tool on this one to remove the material from the “throat” of the horse. It would also have allowed for a more acute angle there since the spindle radius limits how deep you can do. Still, and to my surprise, this one was easier to make than the Bishop. Going by their abilities on the board, the king has to be pretty clunky and heavy, not being able to move any real distance at all per turn. So I wanted to express that fact by making the king just as clunky. I went along with what I had in mind for the rock, with slightly tilted edges and chamfered corners to make it look at least a little “royal”. I always found it to be a little strange that the king would rule the battlefield when it was the Queen who could kick some serious sawdust. So I chose to experiment with small details on this one, using the smallest spindle and some off-center sanding. Frankly, this is my favorite piece. I hope this inspired you to make something of your own – be it a chess set or something creative on the spindle sander. I hope to make a matching chess board soon, too. 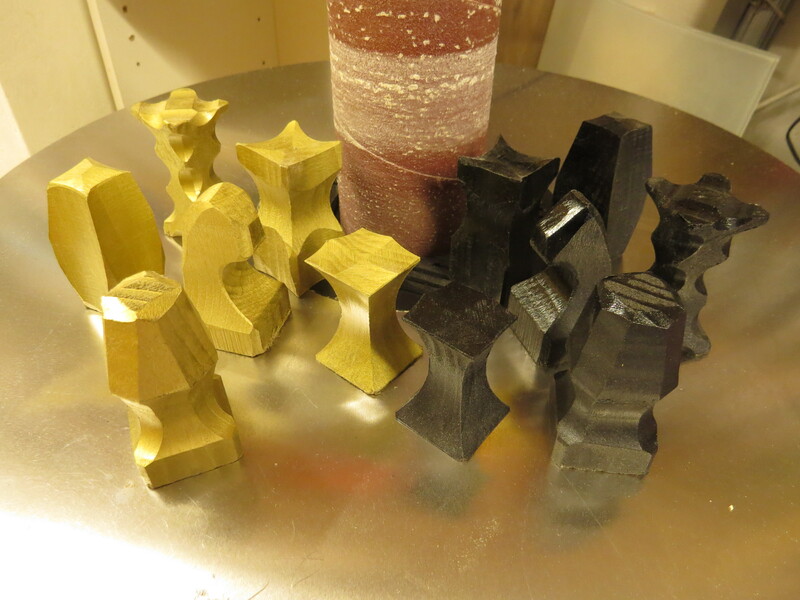 Also, for another set of chess pieces, check out this one and this one by Tim Sway! Thanks for reading, subscribe to my email list, and remember to be Inspired!